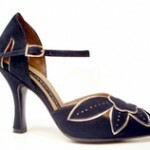 I can’t think of an article of clothing more important to a swing dancer than the shoes he or she wears. Shoes are at the point of most of the impact in swing dancing, they facilitate movement, grace, and athleticism, and they often make a statement about the dancer. Choosing your dance shoes wisely can mean the difference between dancing well and enjoying a night of dancing or a having a night of pain and suffering, either at the dance or after the dance. 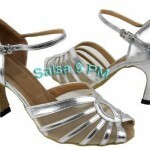 Fortunately, you do not have to sacrifice personal style to find a great pair of dance shoes. In this article I will make suggestions on shoe selections based on my personal experience and the experiences of my fellow dancer friends and provide examples of shoes that I already love and shoes that I am presently admiring from afar. Theoretically, just about any pair of flats could be outfitted for swing dancing. 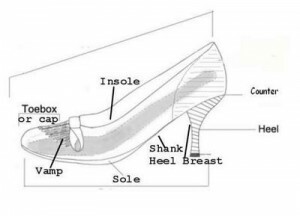 It is largely a matter of personal preference and comfort, but I find that generally what works with flats is having a form that will withstand the athleticism of the dance and a sole that is flat and smooth enough to either have leather affixed to it or be danceable in its own right. One sole that may not need to be sueded are soles that are made with a sort of felt fabric on the bottom of the sole, or a combination of felt and rubber. 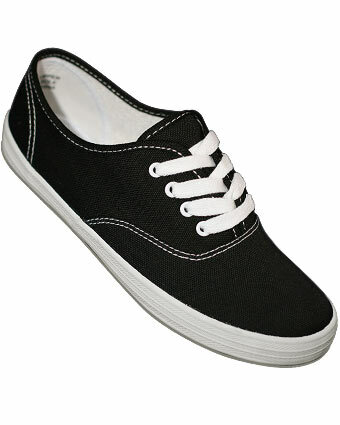 These shoes can generally be found at discount shoe retailers like Payless. I picked up a pair of slip-on canvas sneakers at Payless and a pair of t-strap Converse sneakers from Target with just such a sole and found them danceable on smooth surfaces. Moving up from flats you have the wedge. I’m not certain how many other styles of dancing use a wedge, as I assume it was adapted from the fashion of the swing era and is somewhat indigenous to swing dancing, but this style of shoe can be a real asset to those dancers who may be looking for a more firm sole, a little height, and a way to maintain more of the foot’s connection with the ground (as compared to heels), among other benefits. I had balance issues in my dancing for years and found wedges to be very grounding. Depending on the wedge, I actually feel more comfortable dancing in wedges than any other shoe. I also find them more efficient for switching back and forth between Lindy Hop and Balboa. I do love to multitask. Aris Allen “Rugcutter” wedge: This was my first wedge and is definitely still a fallback. It is also my “fast” shoe if I find I am on a sticky floor. I find that this wedge has a little more flexibility than the Mary Jane and I hear that it is kind to a number of different sizes and widths of feet, given that they lace up and have an adjustable heel strap. 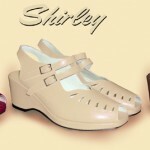 Old Woogies “Shirley” wedge: Definitely admiring these lovelies from afar…one day! The jump from wedges to heels was pretty difficult for me. It took a few months of wearing heels for a few songs then switching back to my wedges to get used to the heels. I can now wear some of my heels for an entire dance, which has incited accusations of Lindy Shopper being on a suicide mission. 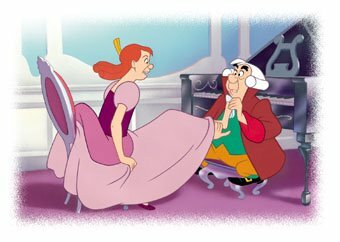 I say if the shoe fits…dance in it! 1) Limit your heel height to three inches. I’m saying three because I understand that some girls with bigger feet can withstand this extra 1/2 inch. My personal rule for heel height is 2 1/2 inches because I know that is the limit of my comfort. The Carrie Bradshaws of the world may be able to withstand the highest heels, but I am fairly certain those ladies are in the minority. 2) Make sure the shoe is wide enough for your foot around the ball of the foot. This is where your foot bends to accommodate movement and will bear the brunt of the impact on your foot. If the shoe is tight, it could rub your foot the wrong way, pinch your foot, or cause other unnecessary discomfort or injury down the line. If the shoe doesn't fit...don't wear it! 3) It doesn’t matter how cute the shoe is, if it doesn’t fit right you shouldn’t wear it. “Fit” does not mean that you are able to fit your foot inside the shoe, it means your foot is able to have enough room inside to do what it needs to do, in this case, a particularly athletic dance. This is applicable to all types of shoes, but I find that I am more willing to compensate if the shoe is particularly fabulous. I’m better at just saying no after the surgeries, but temptation still rears its ugly head on occasion. The right fit for you is a matter of personal preference. Think about your most comfortable pair of street shoes or heels – what qualities in these shoes make them comfortable for your foot? Look for shoes for your dance wardrobe that replicate the qualities of those shoes that fit you well in your life outside of the ballroom. I have to give myself this pep-talk frequently when I am looking at vintage shoes – if only I had a AAAA foot! 4) Add-ons: If you are ordering custom shoes, it’s worth it to pay for that extra padding in the sole and for arch support (or even double arch support, if you need it). Providing your foot with an additional barrier and foundation can improve not only your foot’s well being, but also your dancing. This list is certainly not comprehensive, but those are the main considerations I have when selecting a pair of dance shoes. Remix “Anita” shoe – the combination of lovely vintage styling and soft, flexible leather make this Remix shoe one of my favorites for dancing. My only complaint is there is not enough padding on the bottom to wear the shoe for an entire night of dancing, but I do like to compete in these shoes. Tango shoes – I don’t have to look hard to find vintage styling in tango shoes – they are some of the most delicious dance heels out there, in my opinion. The makers of tango shoes strive for excellence not only in styling, but also in the craftsmanship and comfort of their shoes. Making these custom shoes accessible to the masses has only become easier with online shopping – I can order custom tango shoes made for my feet with an Internet connection, a scanner to scan a diagram of my foot to email to the company, and Yahoo! Babel Fish to help me with the Spanish translation to communicate with the retailer about my order. Six weeks later I have a pair of custom tango shoes in buttery soft leather with added padding, arch support, and the color, heel style and height of my choice. I know there are several tango shoe retailers who offer this service, but I chose to order mine from Jorge Nel because of the available options and the price. I had a very positive experience and I would recommend venturing to get your own pair of custom tango shoes if you are so inclined. Not every pair of tango shoes is custom, but that doesn’t mean the fit and quality are sub-par. Tara Tango shoes do not offer custom-made shoes, but I know some Balboa ladies who swear by them and they are truly lovely shoes. Tara’s “La Luna” is quite possibly the cutest dance shoe ever and now comes in nine different colors. Can't have too many shoes! I would love to have your feedback on shoes that work for you, as everyone has different needs and preferences. I encourage you to leave comments on things that have worked for you when finding dance shoes and any dance shoe recommendations you have for those who may be looking for comfort and cuteness (or hotness, if that’s your M.O.). Happy shopping! This is the second in a series of articles I am writing for the Atomic Ballroom Blog about swing dance fashion, with an emphasis on actually being able to find and purchase these items. You can follow my regular blog at www.lindyshopper.com or you can become a fan on Facebook and have updates appear in your news feed. 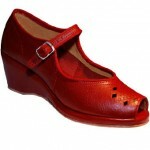 Tara Shoes now offers custom shoes – you can get those Lunas in any combo your little swinging heart desires.